Moto X gets February UK release date | What Hi-Fi? The Moto X initially had a US only release. However Motorola has now announced plans to release it in select European countries. Motorola has recently announced it will be releasing its Moto X smartphone in the UK on February 1st, with releases in France and Germany soon after. The Motorola Moto X was the first handset to be released after Google's acquisition of Motorola Mobility in August 2011 and has an "always on" feature. This allows users to get information from Google Now, simply by saying "OK Google Now." It also implements other intuitive features such as activiating the 10-megapixel camera with a flick of the wrist. However, the 'Moto Maker' customisation options seen in the US, won't be available in the UK on release. Instead, it will be available at a later date. The device has a 4.7in 720p display with 316ppi and a 1.7GHz Qualcomm Snapdragon S4 processor with 2GB RAM. It has 4G connectivity and a 2200mAh battery which Motorola claims will last up to 24 hours. 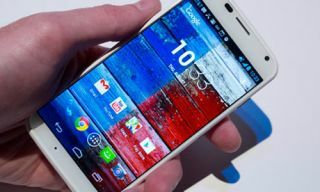 The Motorola Moto X will come running Android 4.4.2 Kit Kat and cost £380 sim-free or from £25 on contract. It will sit alongside the budget Moto-G smartphone which was released in November 2013.